Worldschooling is the intentional act of viewing the world as one’s classroom. The term “Worldschooling” was coined over a decade ago by Eli Gerzon, an unschooled young man who saw the world around him as the greatest classroom available. As an extension of this unschooling advocacy, a worldschooling facebook group was formed . Since 2012, Lainie Liberti has facilitated online communities in support of worldschooling and is committed to her advocay. The Project World School Family Summits are the official gatherings of the We Are Worldschoolers facebook community. There are many worldschooling styles and many ways families address education. Some families often times oscillate from one to several different styles of education, while other families are committed to a particular style for the duration of their children’s school years. All are welcome and all are valid in this at the Project World School Family Summits. There are no right or wrong ways to worldschool, only variations. Within this category there are endless variations. Some families use traditional school curriculum, others use religious-based curriculum. Some families follow curriculum provided by US charter schools. Some families opt for traditional store-bought curriculum and education systems that provide structured methodologies like Charlotte Mason, others prefer Montessori. Classical homeschoolers, Waldorf, multiple intelligences approaches, online schools, self-directed curriculum and project-based homeschooling. These are all valid options. Many families choose an eclectic blend that utilizes some or all of these options and supplement their child’s structured learning based on the places they travel to. All are valid and very personal choices and all have a space at the Project World School Family Summits. A general definition of “unschooling” is to live as if school does not exist. There are deeper philosophies at the foundation of the unschooling movement that include supported self-directed learning as an outcome of natural learning, usually facilitated by the parent(s). Unschooling is a term that the late John Holt coined in the late ‘70′s to describe learning that is based on a child’s interests and needs. Unschooling does not begin with a parent’s notion of what is important to learn and then turn the choices of how to learn the content over to a child. Rather, it begins with the child’s natural curiosity and expands from there. Unschooling is not “instruction free” learning. If a child wants to learn to read, an unschooling parent may offer instruction by providing help with decoding, reading to the child, and giving the child ample opportunity to encounter words. Unschoolers often do no traditional school work, yet they do learn traditional subject matters. They learn it as a natural extension of exploring their own personal interests. Combining travel with unschooling is a natural choice for many worldschoolers as children can’t help but to learn from the world around them. In simple terms, the world teaches. Since learning happens naturally, the freedom to be exposed to new interests through travel has literally transformed the world into an interactive classroom for many. Many report that the newness of daily surroundings provide stimulation and fuel curiosity. Where a family takes it from there is up to them, but the engaged family will most definitely be intentional about learning opportunities. Third culture kid (TCK) is a term used to refer to children raised in a culture other than their parents’ (or the culture of the country given on the child’s passport, where they are legally considered native) for a significant part of their early developmental years. The majority of TCKs live as expats in other countries and attend either international or local schools as part of cultural immersion. Some may enroll in schools for a shorter period of time and some may enroll for longer durations depending on their family’s living and working situations. As a result, kids that are educated in formal settings in a host country are considered worldschoolers. There are those within our community who live the majority of their time in one location creating a base in their home country, whose children are enrolled in traditional schools and they travel as a family during school vacations. Worldschooling becomes an addition to traditional schooling and exposure to the world in this form is still beneficial. Many traditionalists do not travel regularly but try to incorporate world cultures in their lives through a handful of ways: hosting others from other countries, exploring cultures through food, art, cinema, news and engaging in language learning. Those in this category are also worldschoolers and are welcome at the Project World School Family Summits. For those that do actively travel, there are many styles of traveling, which are discussed and supported in at the Project World School Family Summits. Like the educational and learning approaches, many families shift between a combination of these styles at any given time. There are no travel formulas and each family is entitled to choose what works best for them. The Project World School Family Summits are designed to be a supportive place regardless of each family’s style. Below you will find a brief description of some of the travel styles. Digital nomads are people who work remotely, often times using telecommunication technologies to earn a living and conduct their life in a nomadic manner. Digital nomads are sometimes called “location independent” and tend to choose travel locations based on wifi strength and availability and time zones. Long term slow travel is when you take several months or years to make your way around the world, staying in each location for long enough to really soak up the culture. Long term travelers are often budget backpackers, trying to make their travel fund stretch for as long as possible by staying in hostels, local accommodations and looking for cheap food and attractions. Rather than other short term types of travel, long term travel often becomes more of a lifestyle choice. An expatriate (often shortened to expat) is a person temporarily or permanently residing in a country other than their native country. Generally “expats” locate to another country for six months or longer and tend to plant roots deeper than “slow travelers”. Expats move to other countries for a variety of reasons, some for work, some for cultural and language immersion, and others even move to countries where their families originated from. Whatever the reason, expats are also worldschoolers as they are faced with many of the cultural challenges of adapting to a new way of being, and oftentimes have to examine their own worldviews in contrast to the values and worldviews of their host country. We have many worldschoolers who dream of becoming full-time worldschoolers, but for any number of reasons cannot at this time. Instead, they take family trips both nationally and internationally and apply the principles of worldschooling: the world is our classroom, curiosity can spark all learning, and cultural immersion (even for short periods of time) offers rich learning opportunities. We welcome worldschooling vacationers to our Summit. Traditionally, a gap year is when you take a year off to work, volunteer or study in another country. Now, many families are taking family gap years together! “Family Gappers” are generally traveling on a predetermined budget, have scheduled their trip to span over the course of a very specific timeframe and generally pre-plan destinations in advance, often times purchasing round-the-world tickets. “Family Gappers” don’t tend to work during their gap year (although there are always some exceptions) and they generally have a home base to return to. 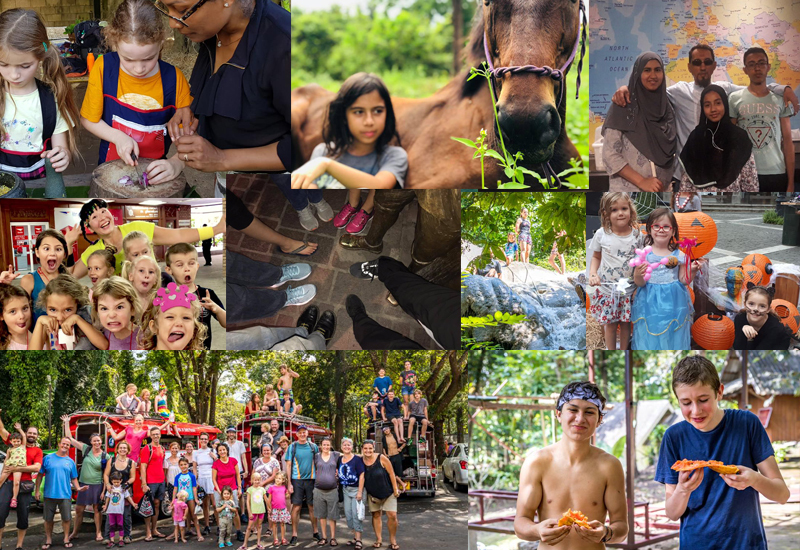 Worldschoolers who attend the Project World School Family Summits are an international community of curious people, whose origins span the globe. We represent different nationalities, belief systems, cultures and worldviews. The ethos at our Summits are to support diversity, honor differences and apply compassion on our worldschooling journeys. As we extend these principles into the world as we travel, we also practice this ethos during the Project World School Family Summits. Just as an anthropologist would approach a culture, we agree we are not out in the world to change people’s beliefs, practices, customs or cultures. As worldschoolers, we travel to learn from these differences and strive to build bridges of understanding and compassion. As worldschoolers, we engage in thoughtful dialogue in order to connect with one another through as an extension of our own humanity. As worldschoolers, we believe these connections create a pathway to peace. As worldschoolers, we believe our journeys have value for ourselves, our children and the world. As worldschoolers, we ask you to apply these same principles of compassion and tolerance at our Summits, just as you would in the outside world.